The student’s grade point average is calculated at the end of each semester grading period and is published on the student’s transcript. 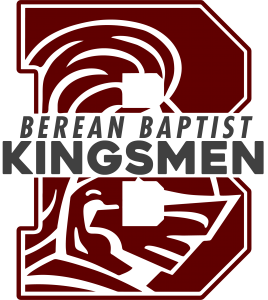 The GPA is derived from all core subjects in which a student earned credit while attending Berean Baptist Christian School. Student has been enrolled in an umbrella program of an accredited school. Adequate documentation can be provided to verify the student has satisfactorily completed the course requirements and that the course requirements are comparable to BBCS academic standards. The student has scored in the 60th percentile on a national standardized test in this academic area. If the above criteria are met, courses taken in a homeschool program may be counted toward graduation requirements, however, the course averages will not be included in calculating the student’s GPA or Numeric Average for determining class rank. In the event that a student cannot meet the above criteria, an option will be given to take a Credit-By-Examination in the course to verify satisfactory completion of the coursework. Students in the 11th and 12th grade may request to take an Independent Study course if their schedule cannot be arranged to complete the course requirements for graduation. These courses must be supervised by a teacher of BBCS and must be completed during academic school year. Seniors must finish all Independent Study courses at least fifteen days prior to graduation. The student’s grade will be determined by test scores and projects. The grade will be included on the student’s transcript, but it will not be included in the GPA or Numeric Average for determining class rank. Exceptions to this policy may be made with an Individual Education Plan (IEP) for students who have extenuating circumstances of prolonged illness or documented severe learning disabilities. The plan will be written and implemented by an academic review committee. The course is not offered at BBCS. The student’s schedule cannot be arranged to take the course at BBCS. The student is attempting to recover credit for graduation. A junior or senior may take correspondence courses as dual credit provided that the course meets the requirements established in the Dual Credit Section of this document. Correspondence courses must be taken from an accredited institution. The student must submit an official transcript for the course to receive credit. This grade will be added to the student’s transcript, but it will not be included in the GPA or numeric average for determining class rank Seniors must complete correspondence courses at least fifteen days prior to graduation. Juniors and seniors may enroll in college concurrently with high school to accumulate college credit or to broaden their academic opportunities. Credit earned through dual credit courses may count towards high school graduation requirements if the college course fulfills the required curriculum objectives. Dual credit courses may only be taken from an accredited college institution. To take dual credit courses, the student must receive parental and administrative approval. The student must incur all costs associated with the course. The student must submit an official transcript with a grade of C or above to receive high school credit. Although credit will be granted for the course, the grade will not be included in the GPA or Numeric Average for determining class rank. Students interested in private or out-of-state institutions should check admissions policies to see if this dual credit will be recognized by the institution of their choice. Summer school opportunities are available for credit recovery or to accelerate their academic plan. The student must incur all costs associated with the courses and must submit an official transcript to receive high school credit. Summer coursework must have administrative approval prior to enrolling.